Ever wonder what a parakeet dressed as pug looks like? Or for that matter, how a pug dressed in parakeet suit for Halloween appears? Well, the answer is probably not in this shape. :) Let’s support LiveMove’s Oakshire Fundraiser to get a bike counter installed on 13th & Kincaid. It’s a pricey ambition, so why not throw down a couple pints to move the needle. 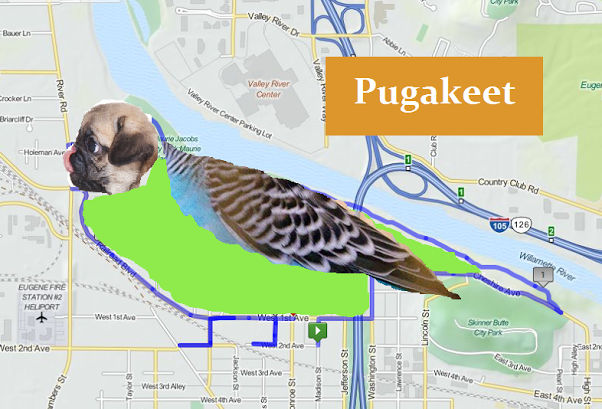 We’ll meet at Oakshire at 7pm, this Wednesday and ride in the shape of the Pugakeet! Hellu BeekeInShepers, zeere-a is a reede-a thees Thoorsdey! (“Hello BikeInShapers, there is a ride this Thursday!” using this Swedish Chef translator). 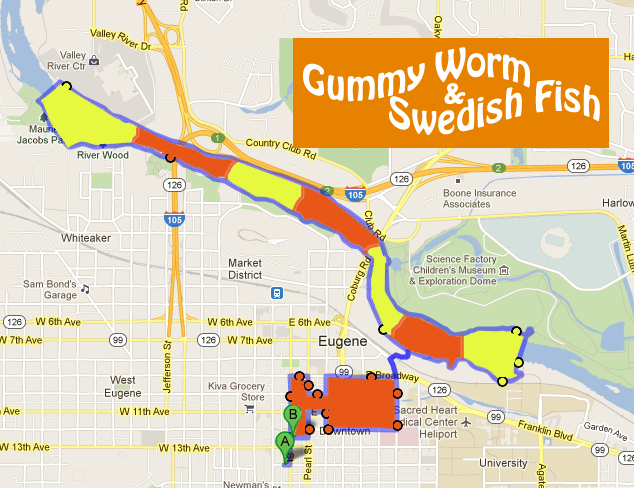 Bork broke bork, it’s time to hit the river and ride the “Gummy Worm and Swedish Fish” next Thursday. We’ll leave Falling Sky at 7:45pm and return for some refreshments on the tail (fin) end. 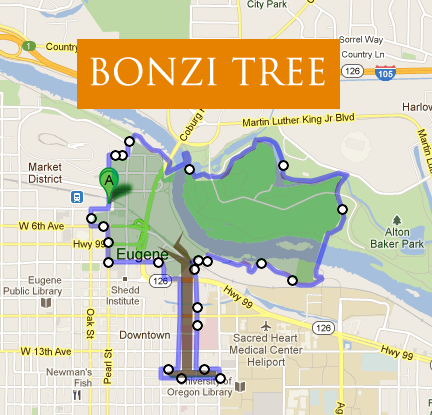 Tree-t yourself to an Earth Week finale! BikeInShapes is supplanting your weekend plans with a 6pm Saturday ride, leaving from Cornucopia (Downtown) this Saturday. A bite/beer will follow. We’ll kick this year off this Wednesday, 7:45 at the Cornucopia (17th & Lincoln) borrowing from the most basic shapes of ’em all: Tetris shapes. 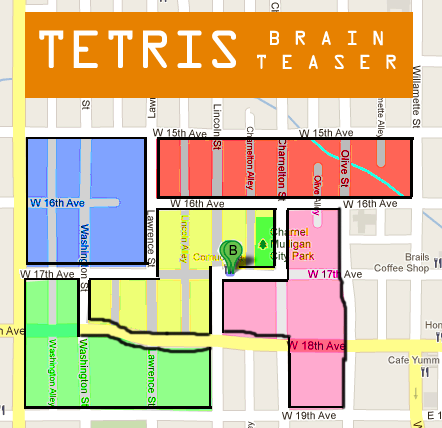 – Traces around each Tetris shape once, without overlapping traces or gaps. It may be impossible! So, the first person to send me a perfectly traced map wins a BikeInShapes T-Shirt. Feel free to bring your solution to the ride. What better way to follow the brain than with a BikeInShapes featuring one of the most intelligent animals on earth. 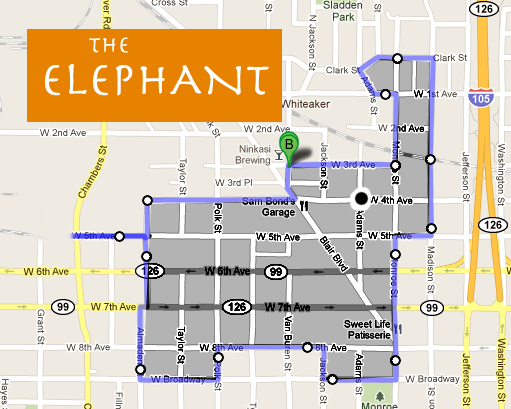 Stomp on down to the “The Elephant” ride on November 17th at 7:45pm leaving from Ninkasi. Ivory much want to see you there! Loooook out BikeInShapers…iceberg a-wedge!! 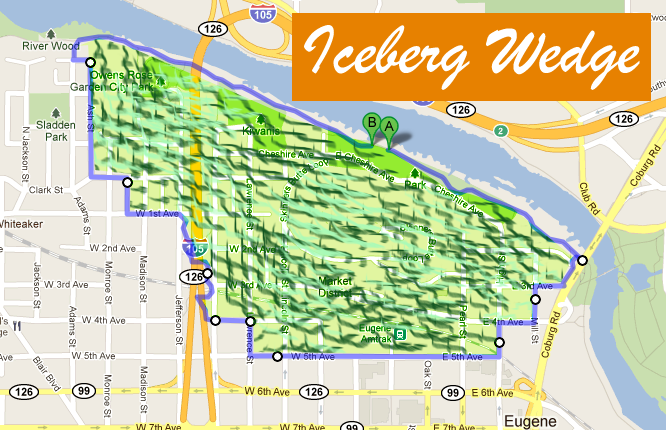 Lettuce ride the “Iceberg Wedge” this Thursday @ 6:30pm from Skinner’s Butte Park (next to the parking lot at High St intersection). We’ll return to the park for a Salad Bar potluck. We’ll set up shop at a table by the High St. parking lot (or the playground we get second dibs). Feel free to bring a salad component por favor. 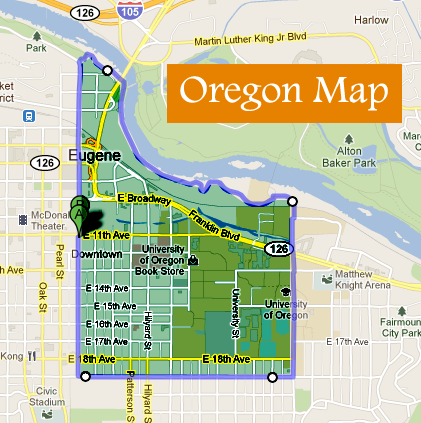 It’s time for the first classic BikeInShapes: The Oregon Map! Let’s honor the most lovely of these United States by oreGUNnin’ around the border of our home sweet home. We’ll start from the High Street Cafe at 7:45 this Thursday, and head up north to the river (look closely, the Willamette may be posing as her big sis). Upon completing the shape, we’ll have some hoppening conversation back at the cafe.